Take I-275 N to Exit 28 SR 694— exit to Gandy Boulevard and go left (west) towards Seminole, Pinellas Park and the beaches—approximately 7 miles—till you come to Seminole Boulevard. Turn right (north) on Seminole Boulevard and it is approximately 1 mile to the studio. You will cross over 86th Ave, N. (2nd traffic light) and the studio is 1 block North of that intersection on the left side of the road. It is in Bay Ridge Plaza, a grey building with maroon awnings. Take I-275 S to Exit SR 688 Ulmerton Road. 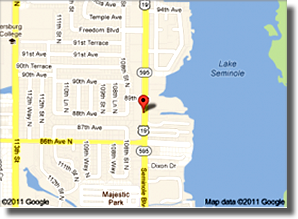 Take Ulmerton Road west approximately 10 miles to Seminole Boulevard. On your left will be Largo Mall. Turn left (south). You will go approximately 5 miles. Watch the street numbers and you can turn right at 89th Avenue. The shopping center, Bay Ridge Plaza will be directly on your left.